Update: The giveaway is now closed. Congratulations to Krystal, winner of the BRIO Family House. Krystal writes, "My twins are loving it!" Every grandchild will have his or her own wishlist and their parents may even ask you to provide something specific on the list. All well and good. Here is a list of items that you may want to give. Some are pure fun, some are educational and some (my favorites) feature something you can do together with you grandchild. Everything on this list is available on Amazon and links are provided below. You may or may not see them at ToysRUs or the other big box stores but they may be at small stores like Learning Express. Of all the thousands –literally- of new toys I looked at this year, these were my favorites. The pictures are my own so they are not perfect but I prefer them rather than the stock photos provided by the toy companies. I am not a business - I am just a grandma with a notebook, camera, and curiosity about what may delight a grandparent and a grandchild. I blog because I enjoy it. I haven't received any compensation for my posts. I have received some samples and, if age appropriate, my husband and I play with them with my grandson in order to do a real life review. This holiday guide is not just pure advertising as many of them are. I have given special attention to items I think are a good value. Both posts feature a giveaway and I am excited to offer the BRIO World Family House as the giveaway for this post. See the giveaway details at the end of the post. They are simple and straightforward and don’t require that you do 10 things. BRIO is well known for its high quality wooden train sets and now they are expanding to other themed playsets that are fully compatible with all BRIO wooden railway sets. You can build the Family House model according to the plan provided or customize it to make your own creation. This wood and plastic colorful set comes with 46 pieces including 4 people figures. The pieces include building and furniture pieces so it is complete and ready for imaginative play. Set it up next to your BRIO railway set for extra fun. Look for more detail in a later post. It is gender neutral and both boys and girls will enjoy playing with it. This bear is soft and cuddly and says 6 phrases when it plays peek-a-boo by holding the blanket up in front of his face and pulling it down. It is battery operated. It is well made and Gund is known for its quality. Sure to bring smiles to a baby’s face. 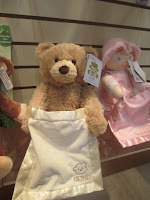 There is also a Spanish language version of this bear. 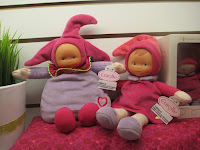 These soft cuddly dolls with a mild vanilla scent are perfect for a baby or toddler. They are small, washable, beautiful, high quality and reasonably priced. 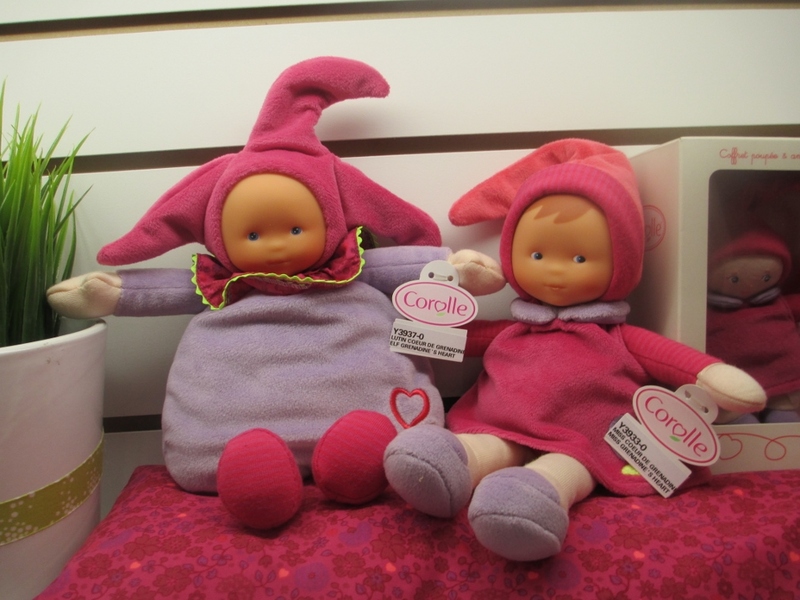 Corolle, a French company, say that they are “specially designed to be easily cradled in your child's arm.” I must say my visit to the Corolle booth at Toy Fair NY each year is always one of my favorites. I gave one of these to my infant granddaughter. 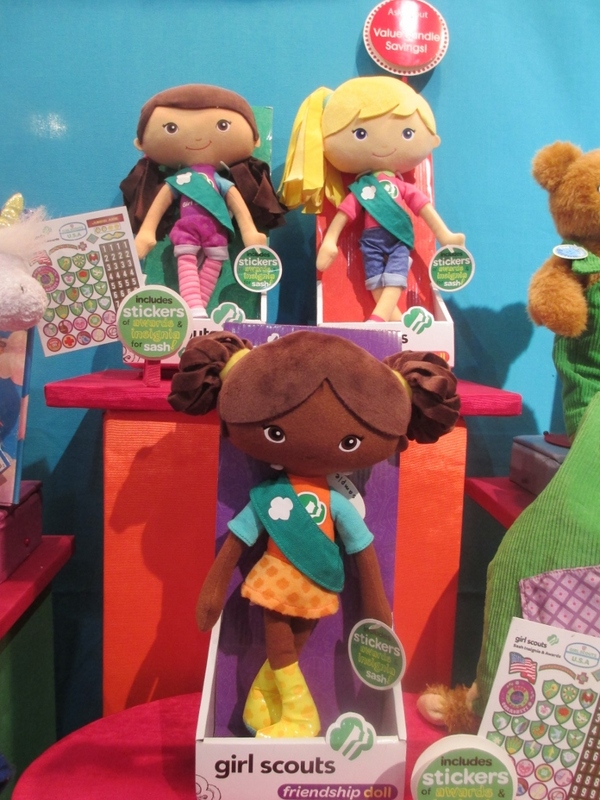 These dolls will be loved by any girl who is a Brownie or Girl Scout. 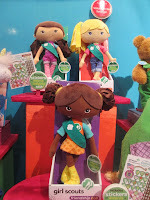 They come with a sash and sticker badges so the doll can earn the same badges as the real scout. They are multicultural so choose the one that the girl you are buying for will most identify with. This is a good quality and reasonably priced item. 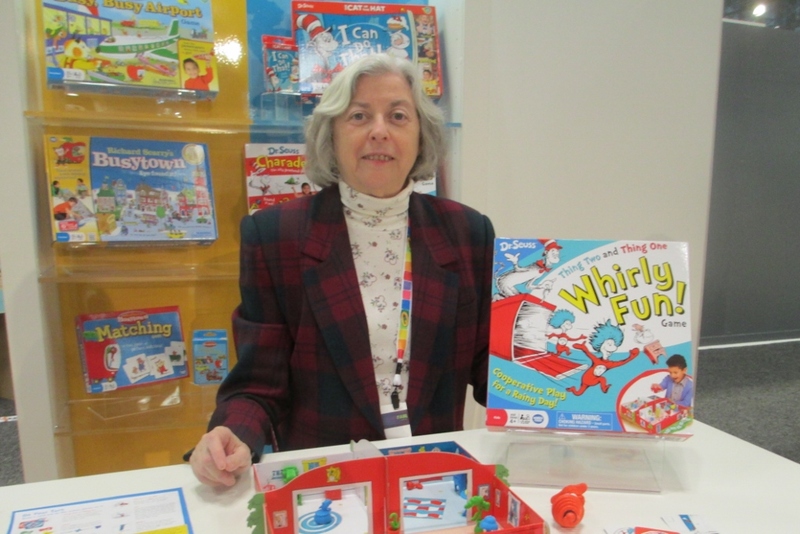 Here I am at Toy Fair NY with a display of various games by Wonder Forge. My husband and I both love playing games with our grandson and we keep a big stack of them at our house. He is 7 years old and we have enjoyed many Wonder Forge games including superhero matching, Peanuts super slides, Busytown and most recently, Bugaloop with a super hexbug. The picture on the left is of my husband and grandson playing Bugaloop. Choose ones right for your grandchild’s age and enjoy the wonderful old fashioned joy of playing a board game. 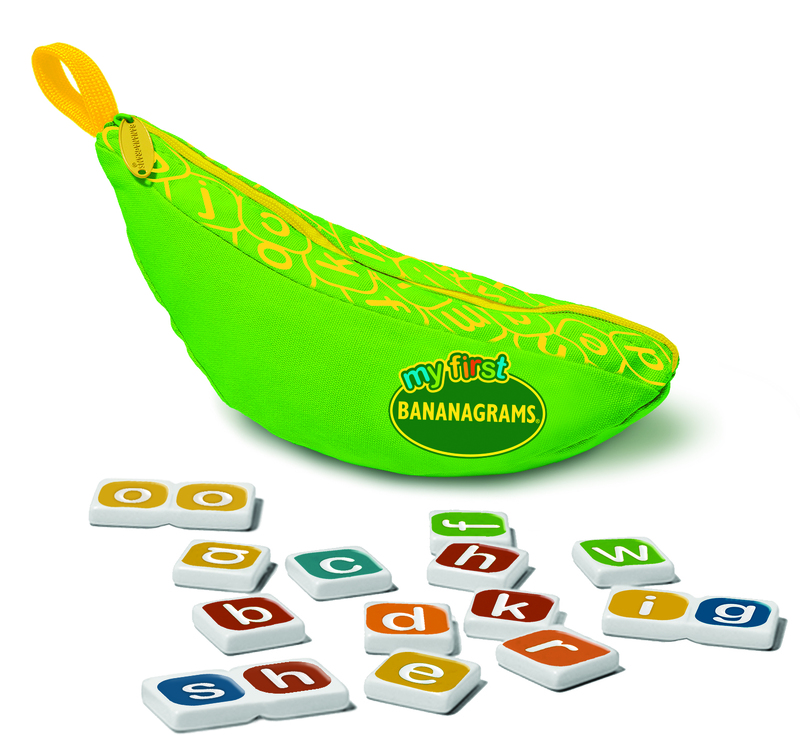 This game is perfect for preschoolers, early readers/spellers and all Bananagrams lovers. 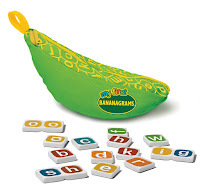 The letter blocks are larger than the original bananagrams and there are some two letter blocks such as sh and oo. 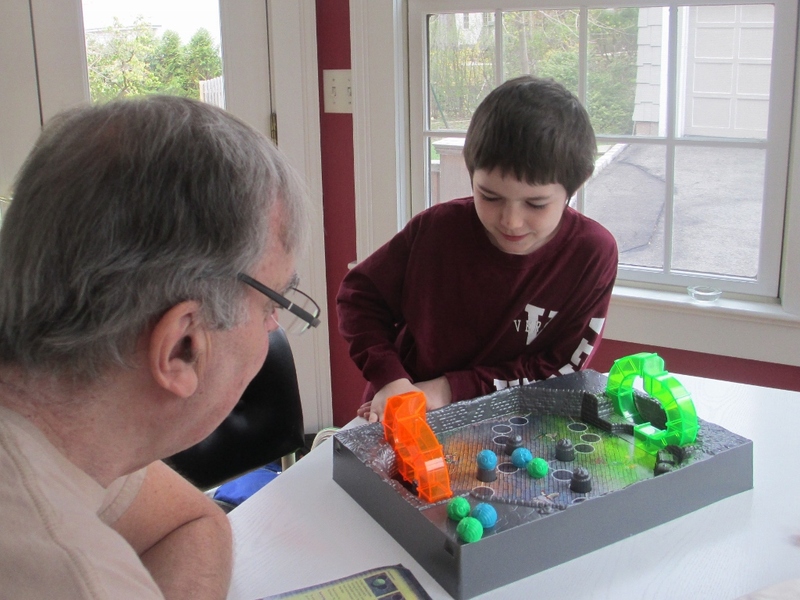 You will enjoy playing with this game with your grandchildren and it is an excellent learning tool in disguise. Eeboo has 4 Pretend Play sets - It's Showtime, Best Pals Diner, World Traveler and School. 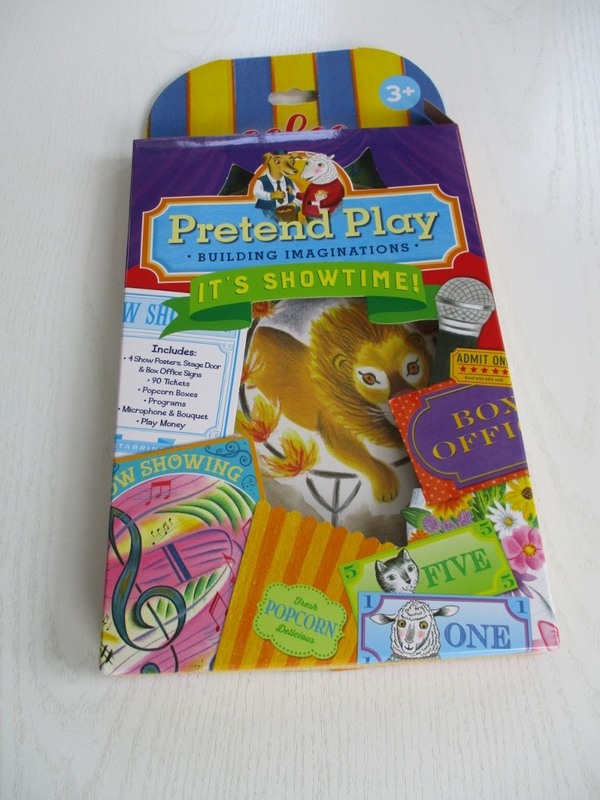 Each set has cardboard and paper props that can be used to give pretend play some professional touches. This is also an excellent item to have on hand for an extended holiday visit with grandkids that can be used to engage with them in pretend play. Emojis are all the rage these days and a wide age range of kids will have fun with this emoji making set. 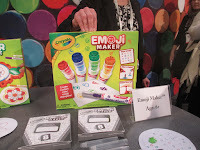 Kids can mix and create their own colors to make 16 emoji stampers. This is a best seller and can make a good grandparent – grandchild activity. It will give you the opportunity to learn about emojis and seem “with it” at the same time. It is a good activity to do with a varied age group of kids and a nice party activity for older kids. 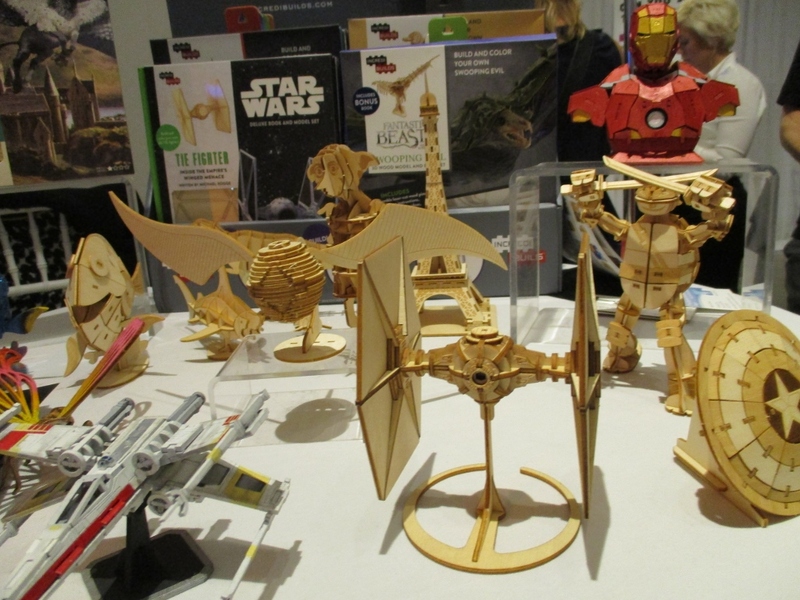 I admit that I love and am always attracted to building toys at the toy shows. These sets all caught my attention. Building sets are wonderful opportunities for grandparent and grandchild quality time together. I like the LEGO Juniors line sized for between DUPLO and LEGO sizes. 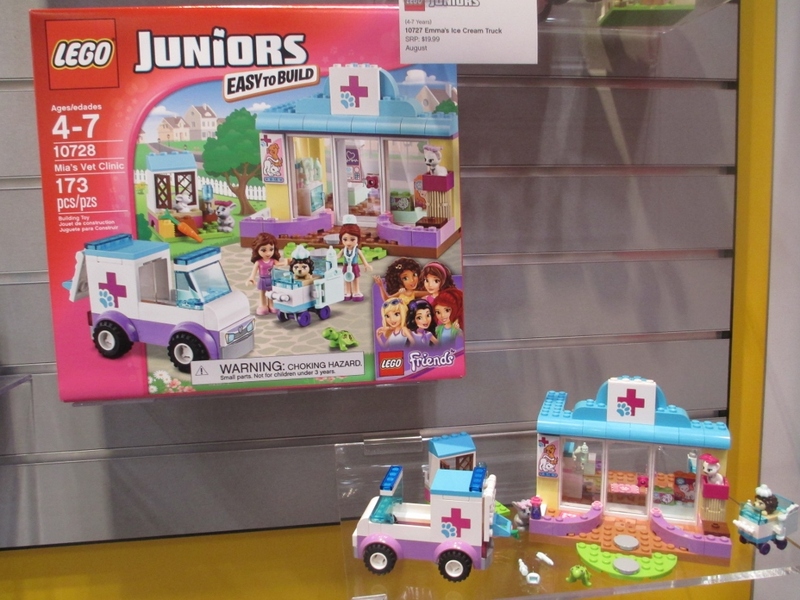 This particular set is aimed at the girl’s market in their Friends line. 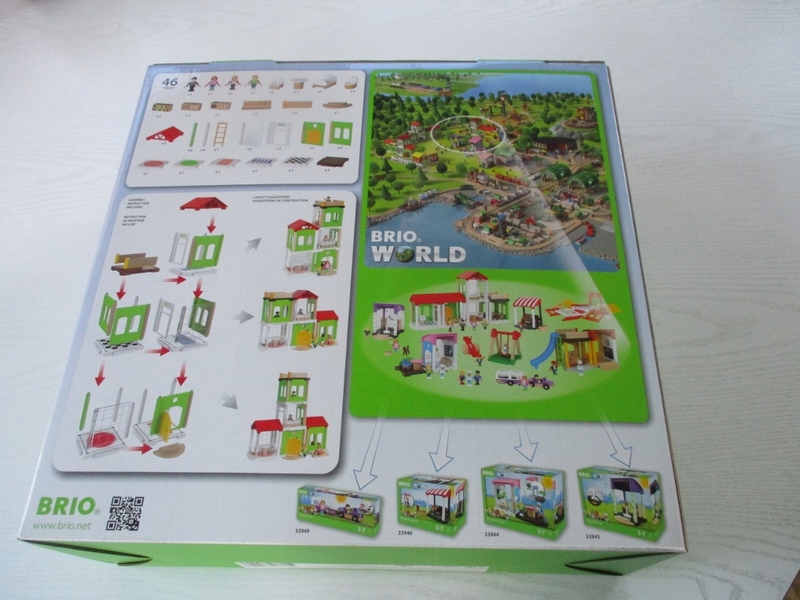 It has 173 pieces including 2 mini dolls and it is reasonably priced. Take a look at the whole LEGO Juniors line – you are sure to find a set you like for the 4-6 year olds. Children who like magnetic sets will love this storytelling building set. 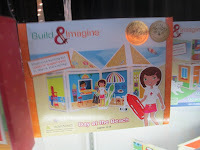 Build and Imagine sets are made up of magnetic storyboards that can be put together in any way a child would like. Sets range in price from $35 to $60. Themes include a beach house, a marine rescue center, a pet portrait studio and more. 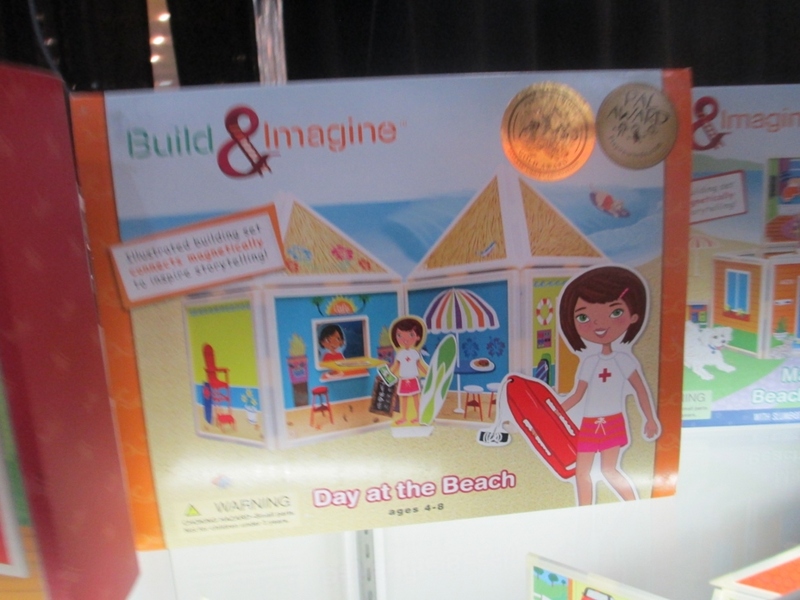 This small company is the winner of many prestigious awards for this creative new product and is nominated for the New Company Toy of the Year Award from the Toy Industry Association. 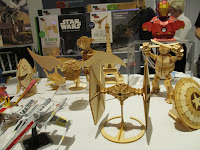 This wooden model are easy to assemble and snap together to form a 3D model of this favorite Star Wars spacecraft. 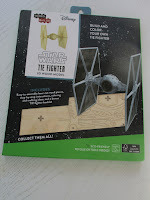 It comes with a hardcover book which provides lots of detail about the TIE Fighter. 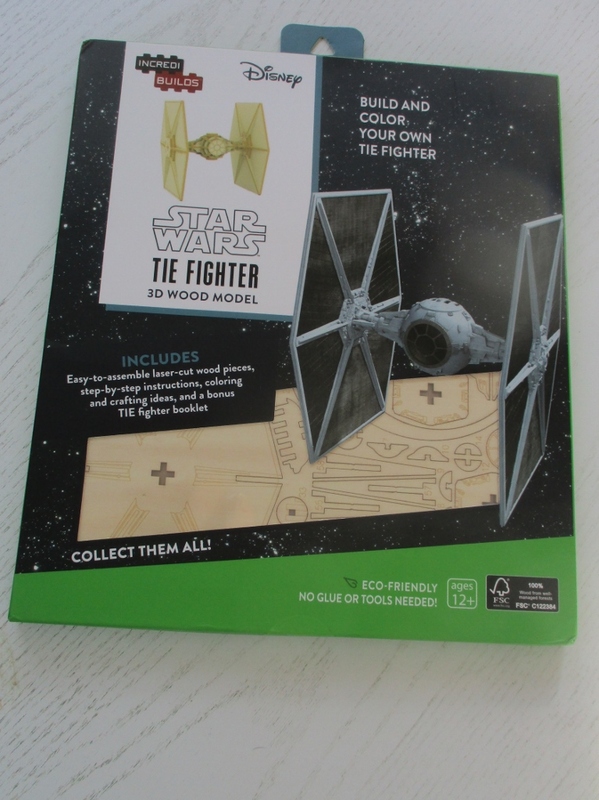 This will be enjoyed by any Star Wars fan and the final product will be something that a child will want to have on display in their room. There is a whole line of these models including Harry Potter themes and the Eiffel Tower. This is an excellent grandfather-grandchild building activity – reminiscent of but easier than the model cars he put together as a boy. 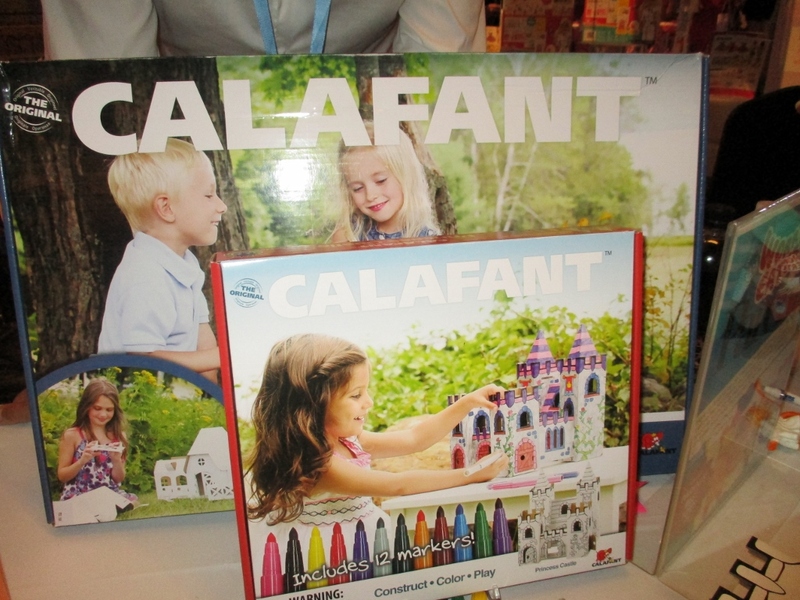 The inexpensive cardboard building sets by Calafant come with markers and so a child can personalize them with their favorite color scheme. The cutout cardboard pieces have an easy interlock system so no glue or scissors are needed. The buildings are a nice size that can be used with small toy figures that a child already has. 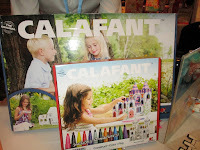 These inexpensive sets are excellent value and grandparent-grandchild working together projects. Great sleepover project. You can have two entries by doing both. Deadline to enter: December 8th, 2016 at midnight. This item can be sent to US addresses only. My twins would love this! Thank you for the giveaway! What a wonderful giveaway! 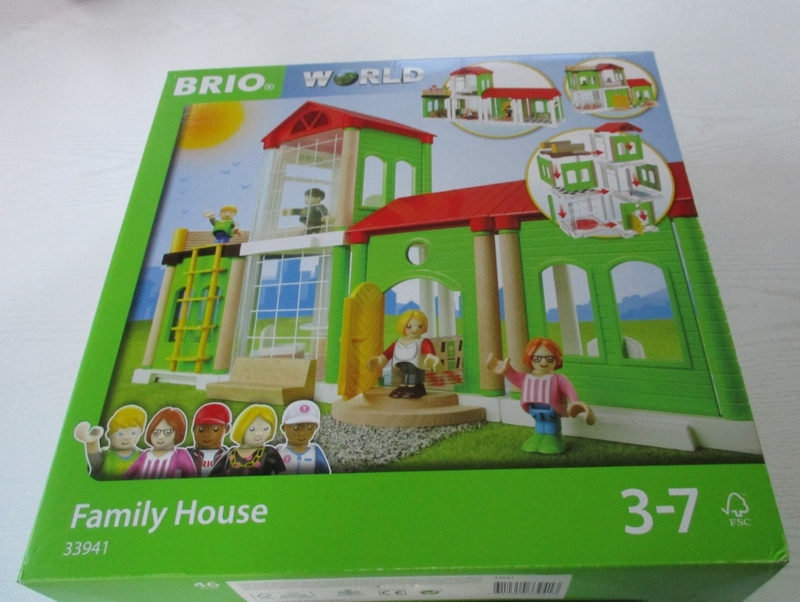 I know my son would just love the Brio house! Wonderful guide for parents and grandparents for some awesome gifts for their children. Thanks for linking up with Blogging Grandmothers. This would be wonderful for my girls! I have 2 granddaughters who would love this! Thank you for the opportunity! I like Granda chronicles on fb. We love Brio toys - have enjoyed their trains for many years. The little ones would love this house! Lots of nice choices you have listed! Thank you for partying with us at #BloggingGrandmothers #LinkParty #4. We’ve shared your post on Pinterest, Facebook, and Twitter. This is so cool! Definitely something my littlest daughter would enjoy! I appreciate the chance to win it for her!!! My son would LOVE this!! <3fingers are crossed!! I love toys like this that promote creativity. Thanks for the giveaway! These are all such lovely choices! Also, thank you for the giveaway! Thank you for such an awesome giveaway! so many neat prizes! my daughter would just love this, so much fun! 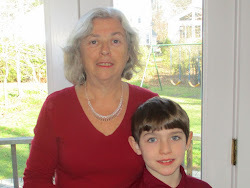 I always enjoy your toy reviews/ I have 14 grandchildren of various ages so I get good ideas from the reviews. Any one of these would be wonderful. With 6 grands, there's at least one in the right age. Gracias for the giveaway.